GroupWise is a platform used for managing emails, calendars, contacts, and other such files. Very often people need to convert GroupWise to Outlook PST for several reasons. However, this process is quite complicated and needs one to be an expert to carry it out successfully. If you want to avoid the risks like corruption of data and incomplete conversion, we advise you to use the GroupWise to Outlook Converter by Shoviv Software. It allows you to convert GroupWise to Outlook PST without any scope of data loss or corruption. Also, the GroupWise files can be transferred to formats like MSG and EML too. With the GroupWise to Outlook Converter, you get not only the freedom to carry GroupWise to Outlook PST conversion but also a variety of benefits. With this tool, you always have full migration of files. So the process to convert GroupWise to Outlook PST includes not only mails but also items like calendar files, task, contacts, attachments etc. 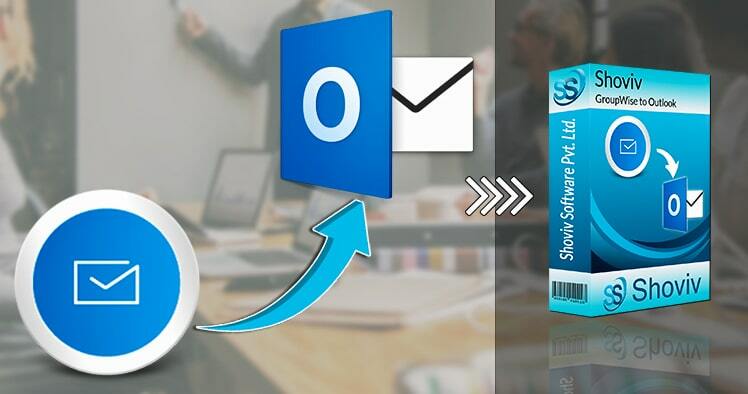 If your aim is to convert GroupWise to Outlook PST without having to deal with the complicated procedures involved in it, you might want to try the Shoviv GroupWise to Outlook PST Converter. It abounds with the latest technologically upgraded features which enhance the task to convert GroupWise to Outlook PST upon the considerable extents. The first step in the process to convert GroupWise to Outlook PST is to add the GroupWise mailboxes. This tool shows its concern for the comfort of the user by allowing different options to migrate mails. One can migrate mail data to PST format using options like online login, default login, cache mailbox login, remote login etc. This tool scans the whole database to make sure that all components of the GroupWise mailboxes are transferred to the PST format. In the process to convert GroupWise to Outlook PST, it exports all details including attributes, attachment files, and metadata. Also, there is no change in the data; they are delivered as a copy. Usually, Outlook comes with a limitation on the size of files; the PST files cannot exceed the length of 50 GB. So in case the files going for GroupWise to Outlook PST migration are too large, they are split by this tool. The user gets to choose the size of the output files and the number of files they would be divided into. This feature makes sure that mailboxes are delivered without any chance of corruption or of incomplete conversion. We at Shoviv Software understand that not everyone who has to convert GroupWise to Outlook PST understands the processes involved in it. This is why we have designed the GUI to fit the needs of all variety of users- beginners as well as experts. You will have a fun time converting GroupWise to Outlook PST without the complications involved otherwise. No one can afford to sacrifice a whole day over the task to convert GroupWise to Outlook PST, getting this tool ensures that you do not have to either. It slashes down the amount of time used in the conversion to the minimum, saving plenty of time. It makes this possible by migrating multiple GroupWise files in bunches at once. To the user’s surprise, the effectiveness of the task remains unaltered. Before the final step to convert GroupWise to Outlook PST is undertaken, the users can have the comfort of checking the data one final time. The preview option lets the users check emails, attachments, and other related data. This step is crucial for ensuring that the files are intact and for cross-checking data. So this tool makes sure that you do not lose your data in confusion and have the desired results every single time. Though this tool is used to convert GroupWise to PST usually, it can be used to convert the GroupWise files into other formats too. Besides PST, the EML and MSG formats are quite popular for saving data too. The good news is, you can convert your GroupWise data into EML and MSG formats as well with this software. Complicated files containing unique data elements like non-English languages and double-byte characters are handled responsibly by this tool. You would be able to migrate your trash data too, meaning that you can rescue the data you deleted accidentally in GroupWise. To try these features out you would not have to pay either. You can convert GroupWise to Outlook PST free of cost and check the features to see if they fulfill your needs. Download it from the link below. You can purchase the full version and convert as many files as you want once you are satisfied with the performance of the trial version.